Welcome to IGNOU MS-09 Solved Assignment 2015 download section of myignou.in. 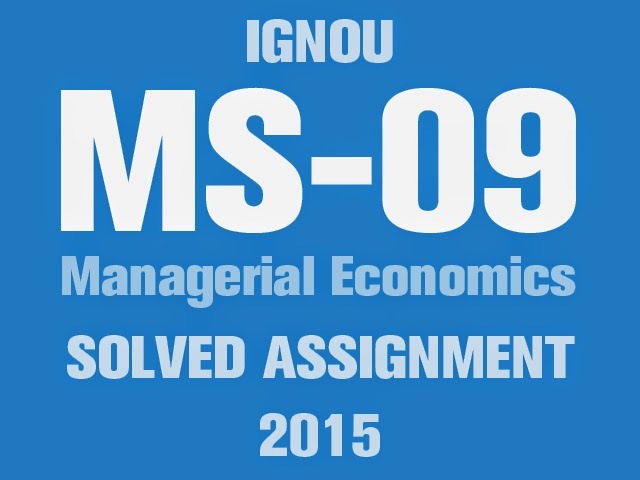 Here you will be able to download IGNOU MS-09 (Managerial Economics) Solved Assignment for January 2015 session for free exclusively on this website. To get other solved assignments like our facebook page. Q1. "The opportunity cost of anything is the return that can be had from the next best alternative use." Explain this statement with reference to gun-versus-butter debate. Ans: An opportunity cost is defined as the value of a forgone activity or alternative when another item or activity is chosen. Opportunity cost comes into play in any decision that involves a trade off between two or more options. It is expressed as the relative cost of one alternative in terms of the next-best alternative. Opportunity cost is an important economic concept that finds application in a wide range of business decisions. Opportunity costs are often overlooked in decision making. For example, to define the costs of a college education, a student would probably include such costs as tuition, housing, and books. These expenses are examples of accounting or monetary costs of college, but they by no means provide an all-inclusive list of costs. There are many opportunity costs that have been ignored: (1) wages that could have been earned during the time spent attending class, (2) the value of four years' job experience given up to go to school, (3) the value of any activities missed in order to allocate time to studying, and (4) the value of items that could have purchased with tuition money or the interest the money could have earned over four years. These opportunity costs may have significant value even though they may not have a specific monetary value. The decision maker must often subjectively estimate Opportunity costs. If all options were purely financial, the value of all costs would be concrete, such as in the example of a mutual fund investment. If a person invests $10,000 in Mutual Fund ABC for one year, then he forgoes the returns that could have been made on that same $10,000 if it was placed in stock RELIANCE INDUSTRIES. If returns were expected to be 17 percent on the stock, then the investor has an opportunity cost of $1,700. The mutual fund may only expect returns of 10 percent ($1,000), so the difference between the two is $700. Share "Download MS-09 Solved Assignment 2015"
Share this page (Download MS-09 Solved Assignment 2015) to let others know about it!